P aeruginosa endocarditis occurs predominantly in two settings: in association with IV drug use (IVDU) or with prosthetic valve endocarditis (PVE). The majority of cases of native valve endocarditis caused by P aeruginosa occur in association with IVDU. Risk factors for endocarditis associated with IVDU include the use of substances that are not boiled after mixing before injection, the injection of drugs at shooting galleries, and the use of pentazocine and tripelennamine. Intravenous drug users often have a combination of these factors. Despite the strong association of IVDU with P aeruginosa endocarditis, S aureus and streptococci more frequently cause endocarditis in IVDU. The tricuspid valve is most frequently infected in intravenous drug users, occurring in over two-thirds of cases. Infection of the mitral, aortic, or pulmonic valves may also occur, and infection of multiple valves is common. Evidence of prior valvular pathology is usually absent, although foreign materials in injected substances may predispose by causing endothelial damage and fibrosis. The infection is usually subacute with fever and cardiac murmur occurring in the absence of other classic stigmata of infective endocarditis, such as Osler nodes, Janeway lesions, or Roth spots. Presentation may be due to complications arising from septic pulmonary embolization characterized by cough, sputum production, pleuritic chest pain, or new infiltrates on chest x-ray. Left-sided valvular disease is less frequently encountered, and embolic complications and cardiogenic shock are frequent sequelae. Ecthyma gangrenosum is rarely encountered in patients with endocarditis. PVE caused by P aeruginosa is often highly aggressive. Diagnosis is based upon clinical illness compatible with infective endocarditis and blood cultures positive for P aeruginosa. Definitive diagnosis is made by recovery of P aeruginosa from blood cultures or tissue obtained at surgery or autopsy. In addition to antibiotic therapy, surgical intervention is often necessary especially in left-sided valvular infections. Successful treatment of P aeruginosa PVE requires surgical intervention together with antimicrobial therapy. Infection of the tricuspid valve may also require surgery if bacteremia persists after 2 weeks of effective antimicrobial therapy or recurs after a 6-week course of antibiotics. The procedure of choice is tricuspid valvulectomy. In cases without a history of IVDU, a tricuspid valve replacement can be performed ~6-8 weeks after valvulectomy. 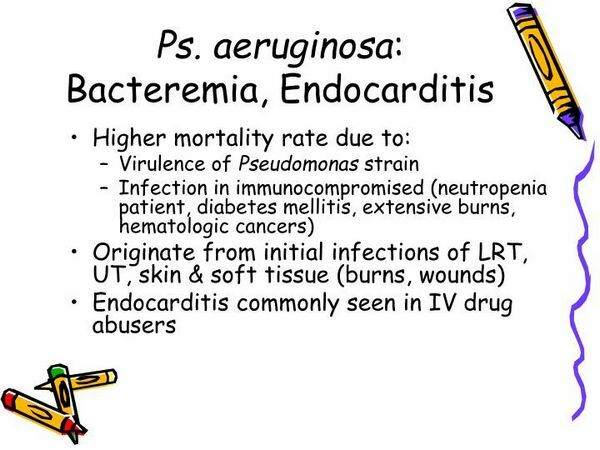 Poor prognostic factors in P aeruginosa endocarditis are an age > 30 years, fever lasting > 2 weeks on appropriate antimicrobial-agent therapy, embolization, mural vegetation, left-sided infection, PVE, and mixed infection, particularly with S aureus as the copathogen.